I get asked that question a lot! Legend, as well as lots of documented stories have it that quite a few Kentucky Moonshiners went blind from drinking moonshine. This high-proof ethanol is a long way from Kentucky moonshine. First of all, those were very crude stills, which only condensed the vapors by running the exiting steam through a coil of copper tubing placed inside a bathtub. There was no "stripping" section, which refers to the bottom section of my still, where the hot steam first has to bubble up through some cold water. This immediately strips out a high volume of water, but in addition, it also traps the fusel oils and methanol, and other trace poisonous by-products. If you look at the alcohol produced by this still, it should be absolutely as clear as water, and if you look at the top surface, you will not see any oils floating at the top. That is what is poisonous, and it has all been removed by virtue of the fact that this is a triple distillation process. If you recall cartoons where they showed a moonshiner drinking out of a pottery jug with four X's (XXXX ) on it, that refers to the number of times the stuff has been run back through the same still, to remove more water (increase the proof). In case you never were told the definition of proof, 200 proof is 100% alcohol, 180 proof is 90% alcohol, etc. About the most a person can comfortably drink is 100 to 120 proof. Most whiskies are about 100 proof, and would make pretty poor fuel. Brandy might be 120 proof, or 60% alcohol, and could be used, but it would have to be a pretty warm day, or the engine already pretty hot from running previously on gasoline for it to work. When you have a lower proof, you have to preheat the fuel to get it to ignite. You can drop a lit match into 160 proof and it will go out. When a waiter serves something with flaming brandy, they have to hold the match for a moment at the edge of the liquid, which preheats it slightly, before it will light. Moonshiners often didn't have soft copper tubing which could be made into a coil, so they would solder short pieces together into a zig-zag assembly using lead for solder. The hot alcohol, being a rather effective solvent, would always pick up quite a lot of lead in the process, and these guys would usually die quite young of kidney failure. I never drank my own product: I do not like, nor have I ever liked hard liquor of any kind, as it will burn it. But 160 proof it much too concentrated for anybody's tongue. The highest proof drinking alcohol I have seen on the market is 120 proof Jamaican Rum. So, when you are making 170 or 180 proof, if someone wants to drink it, they will first have to mix it about 50/50 with water, or orange juice, or whatever, and it will still be too strong a drink. In the USA, it is illegal to sell this stuff without first adding something that first ruins the taste and smell, and completely poisons it so it cannot be used for human consumption. This is then called denatured alcohol. It started out as grain alcohol, which is what ethanol is technically called, but ends up smelling like rubbing alcohol from the drug store because they added benzene or something equally poisonous. When I went to Ukraine, they were very interested in buying one of my stills as they just really wanted it for making vodka. I wouldn't make one for them, as I am fairly anti-alcohol, as I have seen how it destroys minds, families, cars, and uninvolved bystanders. However, some of the stuff I made, especially when I used grape pulp from the winery, which yielded the smell of brandy, or the beer I used from the brewery in Boulder, which made a whisky smell, has indeed looked and smelled pretty pure. Because the alcohol is so strong,it is inadvisable to even taste it, as it immediately dehydrates whatever skin cells it touches, especially the tongue and cheeks. Alcohol this strong is hygroscopic, which means it draws moisture out of anything it contacts, even the air. So high-proof fuel must be kept sealed, or it will get diluted from the humidity in the air. Robert Warren's advanced three-in-one still design incorporates automatic temperature control. It is an elegant tool, suitable for making enough fuel to run your own car or truck, power your farm tractors, or even to start your own alternative fuel co-operative! 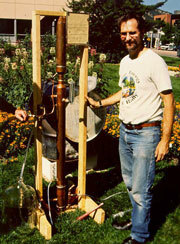 The very first time I ran this still, demonstrating it in public at the Boulder New Renaissance Fair, it made 180 proof out of some 6% beer, which we used in a VW Rabbit. It only cost $15.00 in parts to convert it from a gas burner to a barley burner. This still makes 3 gallons/hour of 180 proof, with the automatic temperature control valve. An old time pot still like this may provide you with a couple liters of homemade hootch, probably about 100 to 120 proof. This moonshine is also likely to contain small poisonous amounts of methanol, fusil oil and other poisonous alhehydes. 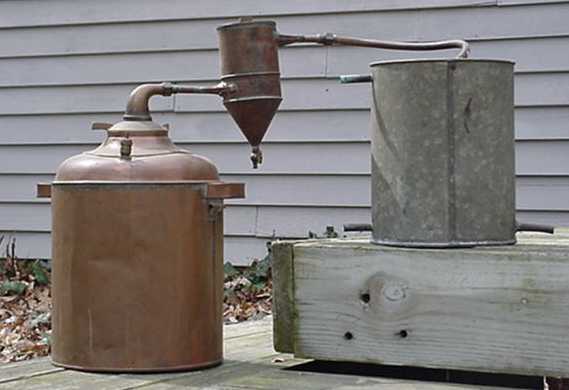 Click here for Tony Ackland's very comprehensive website on alcohol distillation. He is a true expert, and there is lots of good stuff here. He shows a lot of stills, mostly for making small quantities of drinking alcohol. If that is what you are after, spend some time on his site. My still is listed there for making alcohol for fuel. Same stuff, really, but I don't care what mine tastes like: I just want a good source of clean, powerful fuel. You will also find lots of info on mashing and fermentation.